Visitors get a real sense of the ongoing slaughter of Africa’s elephants as they walk through a ring of 80 tusk arches, as this represents the average number that are still killed every day for their tusks. At the end of the arched walk, the “Not for Sale” garden opens into an African savannah with arid grasses, plants and acacia trees where the “bones” of an elephant lie in the dust, all that is left behind by the devastating illegal ivory trade. 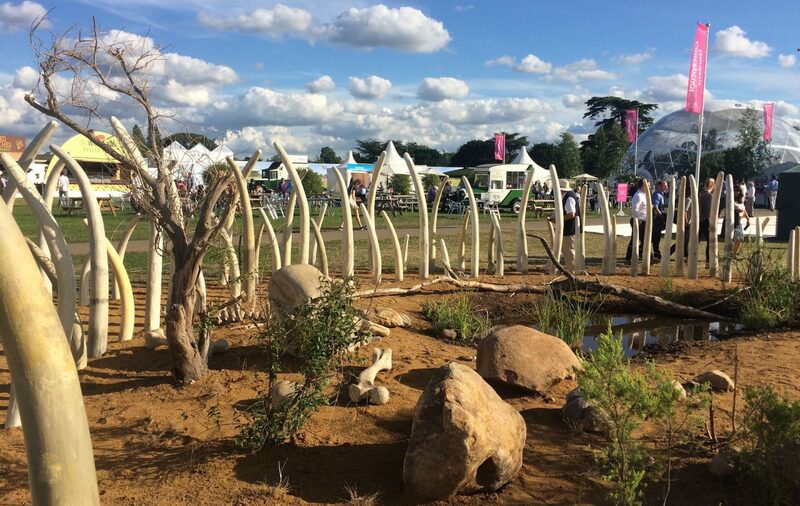 Tusk is extremely grateful to the garden’s creators Sharmayne Ferguson and Mark Whyte of Ferguson and Whyte Garden Design, and to Cotswold Wildlife Park & Gardens, the very generous sponsors of the garden. We also greatly appreciate the support of DHL, who helped transport the acacia trees all the way from Oman in readiness for the event. The Hampton Court Flower Show runs until Sunday 9th July. Click here for more information on visiting the garden.